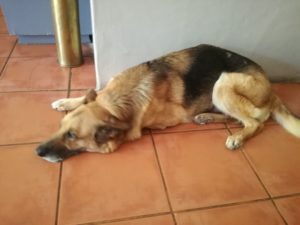 Then Helga became ill. Less than two months after coming on heat, the seven-year-old dog started to lose weight and was lethargic. “I could see she was off colour. She didn’t move; she wouldn’t get off her sofa,” says Mr Schmidt. 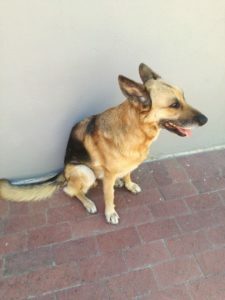 Mr Schmidt brought Helga to Country Animal Clinic in Somerset West. “I immediately suspected a pyometra*,” says veterinarian Dr Ingrid de Wet. Helga underwent a sonar examination, was admitted to the clinic and put on a drip for an emergency sterilisation. The surgery proceeded well. By the next day she was like a new dog. She was eating well and she could go home. “*Pyometra literally means ‘pus in the uterus’,” Dr de Wet explains. “Dogs are designed to have a litter every time they come on heat. When they don’t have a litter, the wall of the uterus thickens. Eventually when they are older this thick uterine layer produces mucous which can become infected. Dr de Wet says if the cervix is closed the owner won’t see any vaginal discharge. In this case the dog normally arrives at the vet when they are already very ill or in septic shock. “Pyometra is the MAIN reason we recommend sterilisation as a puppy. Not only do you prevent unwanted litters and mammary cancer but you prevent this life-threatening condition. Even if your female dog is 5-6 years old and she has been having heats with no problem, you never know which heat cycle will push her over the edge into a pyometra. “A sterilisation is much easier, cheaper and lower risk than an emergency operation in a sick, older dog,” Dr de Wet says. Mr Schmidt is astounded at how well Helga has recovered. “By the second day her ‘colour’ had come back,” he says. “I was worried that the sterilisation would make her fat and lazy but the benefits have been fantastic, aside from saving her life. She is so full of life now; full of energy and wants to play again. “I would honestly recommend sterilisation. In fact, I’m taking my Jack Russell in for sterilisation too,” Mr Schmidt says.